Apalopteron familiare hahasima - photo by Outsuka Hiroyuki. Apalopteron familiare, the Bonin honeyeater, is a small bird of the Japanese Ogasawara (or Bonin) island group in the north-west Pacific. Phylogenetically speaking, it's been shuffled around a bit over the years - originally described as a species of bulbul, it seems to have been regarded by many authors as some sort of timaliid (babbler) until Deignan identified it in 1958 as belonging to the Meliphagidae (honeyeaters), mainly on the basis of its branched, brushed tongue. There it stayed until molecular analysis re-identified it as a member of the white-eyes (Driskell & Christidis, 2004). There are two funny things about this - (1) Apalopteron really does look like a white-eye (albeit a large one), so identifying it as one is hardly surprising; (2) further phylogenetic analysis has also placed the white-eyes (previously regarded as a separate family) within the Timaliidae (Gelang et al., 2009), making Apalopteron's older position correct after all. The Ogasawara islands are arranged in three groups - from north to south, these are the Mukojima, Chichijima and Hahajima groups. Shima (which often becomes voiced to -jima when used in a compound) is Japanese for "island", while chichi is "father" and haha is "mother" (other islands in the group include ani and otōto [elder and younger brother] and ane and imōto [elder and younger sister]). Apalopteron familiare was originally found on all three groups, but currently survives only in the Hahajima group. As on many Pacific islands, the Ogasawara fauna has been pretty heavily hit since the arrival of humans due to habitat disturbal and introduced predators - among the endemic species to have become extinct in the group are a heron (Nycticorax crassirostris), pigeon (Columba versicolor), thrush (Turdus terrestris), finch (Chaunoproctus ferrugineus) and bat (Pipistrellus sturdeei) (Iwahashi, 1992). The type subspecies of Bonin honeyeater (Apalopteron familiare familiare) became extinct on Mukojima by the 1940s (Morioka & Sakane, 1978)*. Kawakami et al. (2008) found that dispersal between populations of Apalopteron on separate islands was very low, which would further increase its vulnerability. *It is possible that a bit of revision may be required here. Suzuki & Morioka (2005) indicated that the type locality for Apalopteron familiare was probably Chichijima rather than Mukojima. Chichijima is considerably closer to Hahajima than it is to Mukojima, raising the question of whether the correct subspecies has been identified as the type. Gelang, M., A. Cibois, E. Pasquet, U. Olsson, P. Alström & P. G. P. Ericson. 2009. Phylogeny of babblers (Aves, Passeriformes): major lineages, family limits and classification. Zoologica Scripta 38: 225-236. Iwahashi, J. (ed.) 1992. Reddo Deeta Animaruzu: a pictorial of Japanese fauna facing extinction. JICC: Tokyo. Kawakami, K., S. Harada, T. Suzuki & H. Higuchi. 2008. Genetic and morphological differences among populations of the Bonin Islands white-eye in Japan. Zoological Science 25 (9): 882-887. Morioka, H., & T. Sakane. 1978. Observations on the ecology and behavior of Apalopteron familiare (Aves, Meliphagidae). Memoirs of the National Science Museum, Tokyo 11: 169-188, pl. 7-8. Suzuki, T., & H. Morioka. 2005. 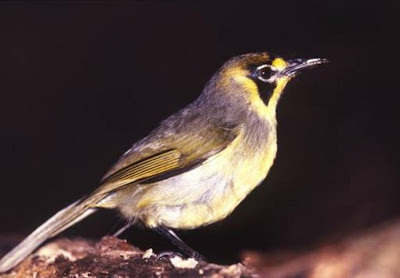 Distribution and extinction of the Ogasawara Islands honeyeater Apalopteron familiare on Chichijima, Ogasawara Islands. Journal of the Yamashina Institute for Ornithology 37 (1): 45-49.
chichi is "father" and haha is "mother"
That's sort of funny, because Japanese h usually comes from earlier p, so apparently at one stage Japanese had papa for "mother".